Designers who think that injection molding is the only way to fabricate stylish plastic parts are behind the times and need to take a second look at thermoforming. While it’s true that thermoforming is ideal for large, flat parts, the capabilities of the process extend much farther, due to many technology innovations and the availability of new sheet materials. 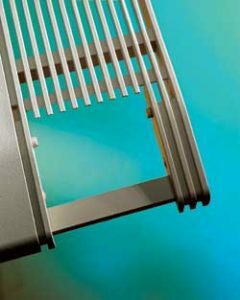 This is an example of a pressure-formed grille that demonstrates the design flexibility that can now be achieved with thermoformed parts. Freetech Plastics has been a leader in stretching the design limits of thermoforming and in developing an approach that’s become known as the West Coast Style of thermoforming. The West Coast style concentrates on more dramatic shapes with sweeping curves, deeper draws, larger undercuts, and the use of rib structures. Because this approach relies on painting after forming, it eliminates the need to mold in texture and color, a need that can restrict part design to a more conservative style. A number of designers have already gotten the message and are working with Freetech to provide their customers with creative concepts. For example, Lunar Design, Palo Alto, Calif., has won five design awards from ID Magazine for projects on which Freetech thermoforms the enclosures. Frog Design, Sunnyvale, Calif., and Ziba Design, Portland, Ore., have also each won a design award using parts formed at Freetech. 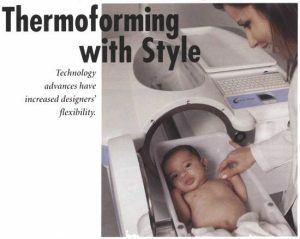 Life Measurement’s Pea Pod air displacement plethysmograph assesses infant body composition. The top part of the machine enclosure is pressure formed by Freetech Plastics. Thermoforming also gives designers the freedom to use significantly fewer parts, notes Freeman, and new techniques are allowing them to do things they couldn’t do before. For example, Freetech can perform insert forming, which it does to produce the Xenogen enclosure (see photo on next page). “For structural purposes, we inserted some machined corner blocks and formed the material around them,” Freeman says. Credence Kalos XW Testhead uses pressure formed enclosure parts that illustrate the curvaceous aesthetic representative of the West Coast style of thermoforming. side, additional structural support and part nesting type features can still be added to the back side by bonding machined parts after forming (See the example in top right photo). Vent openings on parts can be achieved by designing in deep drawn rib structures, then machining the openings off the backside. Freeman also refutes the myth that thermoformed parts cannot achieve the same level of aesthetic quality of injected molded parts. 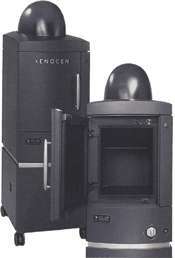 Xenogen Ivis 200 Laboratory Imaging System also uses enclosure parts pressure formed at Freetech Plastics. Depending on a particular part design and size, thermoforming can often match, or even exceed, the productivity of injection molding by using inline or rotary machines. So when should someone use thermoforming instead of injection molding? There’s not one simple answer. Volume plays a huge role, given the difference in tooling costs. Lower volumes favor thermoforming, since thermoforming tooling costs are only 10 percent to 15 percent the cost of injection molding tooling. 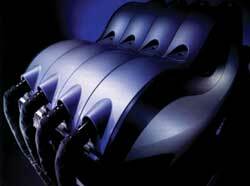 Part complexity and shape are big factors, since they affect tooling costs. And, of course, size is important. Very large parts favor thermoforming, while very small parts favor injection molding, where multi-cavity tooling can be used. For medium sized parts, all the factors must be considered together: complexity, size, and volume. Material choices also affect the decision making process, since not all engineering resins are available in the extruded sheet form that is used by thermoforming machines. However, resin suppliers continue to roll out new thermoformable materials every year. Available materials already include the olefins, ABS, polycarbonate, nylons, polyphenylene sulfide (PPS), and thermoplastic elastomers such as DuPont’s Hytrel. Last year, DuPont also introduced a thermformable version of its Delrin acetal. Freetech Plastics was the first company to demonstrate the feasibility of thermoformed Delrin, which DuPont is aiming at the medical equipment segment because of the material’s high chemical resistance. 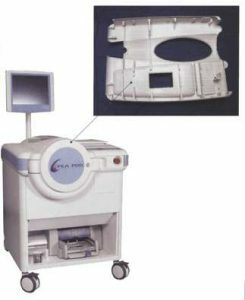 Conventional thermoforming methods have long provided parts for commercial appliances such as refrigeration and vending machines, but the new techniques have also allowed thermoforming to provide innovative solutions in segments such as medical equipment, laboratory equipment, fitness equipment, business machines, and lawn and garden equipment. Some manufacturers of consumer electronics have even turned to thermoforming for the large housings used in projection television sets. Such parts were typically injected molded in the past. Thermoforming may not be the best route for every application, but it should definitely be looked at first on large parts.